Today, while chatting with my friend Andy, we started talking about buying milk back home. 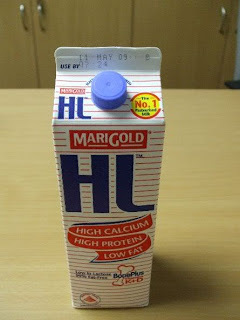 Andy recommanded me to drink Greenfields milk but I told him my family has been drinking Marigold HL for many years & its only S$5.35 for 2 packets. I told him its probably the only best and cheapest milk I ever come across. 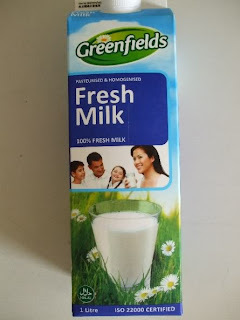 Andy explained to me that's what he thought HL was good too until he was told by a promoter in NTUC, Jurong Point that Greenfields is the only milk with ISO 22000 certified and its 100% fresh with no preservatives. No other brands can make this guarantee so far. Furthermore, Greenfields milk are also used in Starbucks coffee to ensure good quality. The best part is that during promotion, Greenfields costs only S$5.15 for 2 packets. That means I save 20cents for every purchase. After considering all the pros and cons, I decided to give Greenfields a try. I love it very much, it was not as "thick" as Marigold and it easily 'slips' into our throat. Do note that Greensfield milk comes from Australian cows that are reared in Indonesia. Read interesting articles about the 2 brands of milk below.